This is probably one of the easiest Spanish recipes we have ever added. 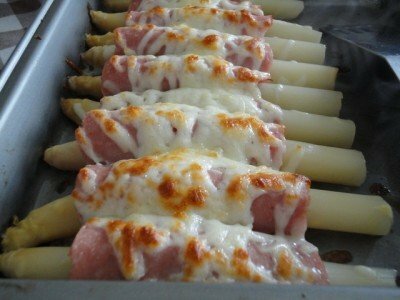 Espárragos gratinados is basically asparagus wrapped in ham, topped with cheese… and bunged under a grill. So… do I just hit “Publish” on this now then? No… okay… I’ll waffle for a bit longer. For this recipe, you can use either fresh asparagus or the prepared sticks that come in jars – it’s a matter of taste. You can also use packet cooked ham, or you can use jamón – again it’s a matter of taste. Cheese – once again, it’s whatever you like. Don’t use anything TOO strong though, or you will overpower the asparagus. Personally, I like to use fresh asparagus, wrap each stick individually in jamón, and then pop a bit of grated manchego over the top before popping it into the oven. Don’t put too much cheese on it though, or it can be a bit greasy and overpowering. If you use asparagus out of a jar – pat it dry before assembling your dish. If you are using fresh asparagus – you may wish to precook it a little. Bring water to a boil – at boiling point, throw your asparagus in. Cook for only 5 minutes before draining… or 7 minutes if your sticks are particularly large. Watch your fingers if assembling the sticks whilst still hot. Whichever ingredients you choose… about 4 or 5 sticks of asparagus per person will provide a tapas sized dish… great as a “starter”. Or serve it with a leafy salad for a light lunch.